Commentary: Short of battle damage and a scarred face, this Kylo Ren is unique. How? 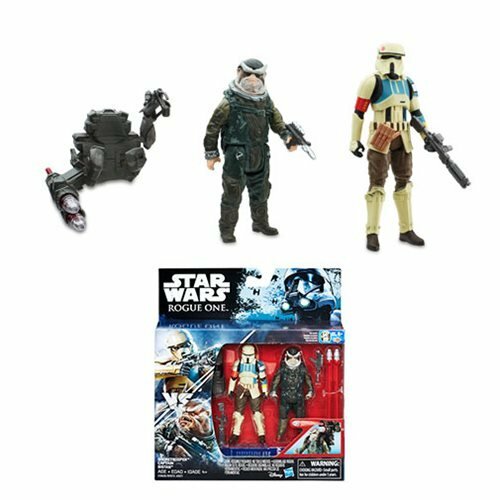 It's the only 3 3/4-inch figure to feature a removable plastic hood in addition to a helmet. 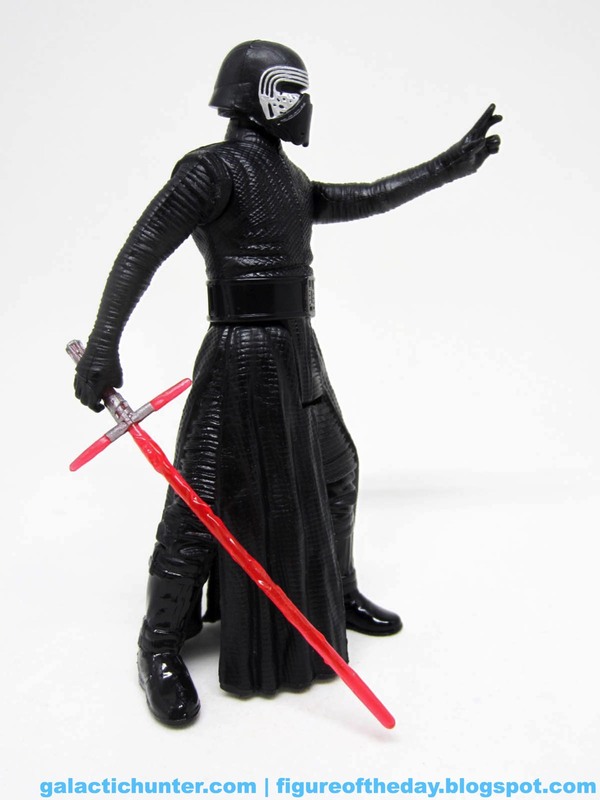 Most helmeted Kylo Ren figures have a plastic hood sculpted to it, and this one doesn't. That's why it's special. 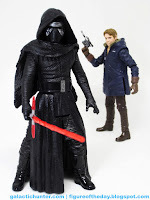 It's the unmasked Kylo Ren [FOTD #2,265] body with a different head, basically. That's the long and short of it. The helmet's great. Armor Up Kylo Ren also had an unhooded helmet, but the hood couldn't fit over said helmet. 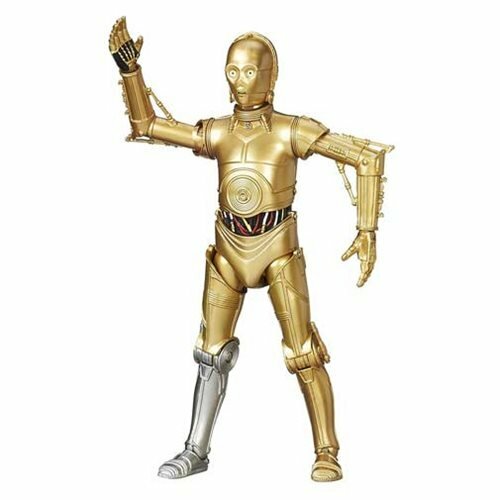 His hands have a fist clenching a lightsaber, and another hand doing a "Force" pose. It ain't bad. The legs have the slightly spread pose which will no doubt be a nightmare for cramming in a vehicle down the road, but the split robes exposing a little pant leg is what sets this figure and the unmasked one apart. 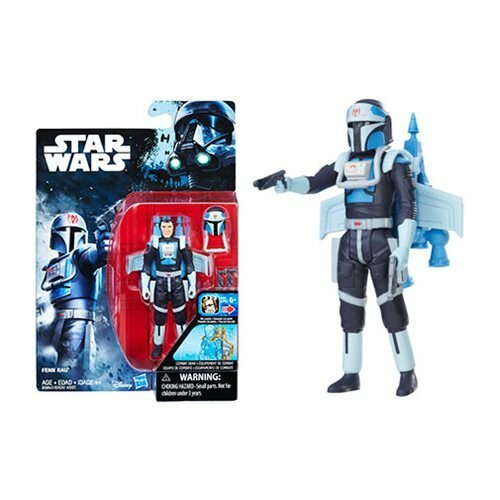 He's got no problem holding his lightsaber, and the launcher accessory has a rubbery grip that opens a bit to grip his arm. 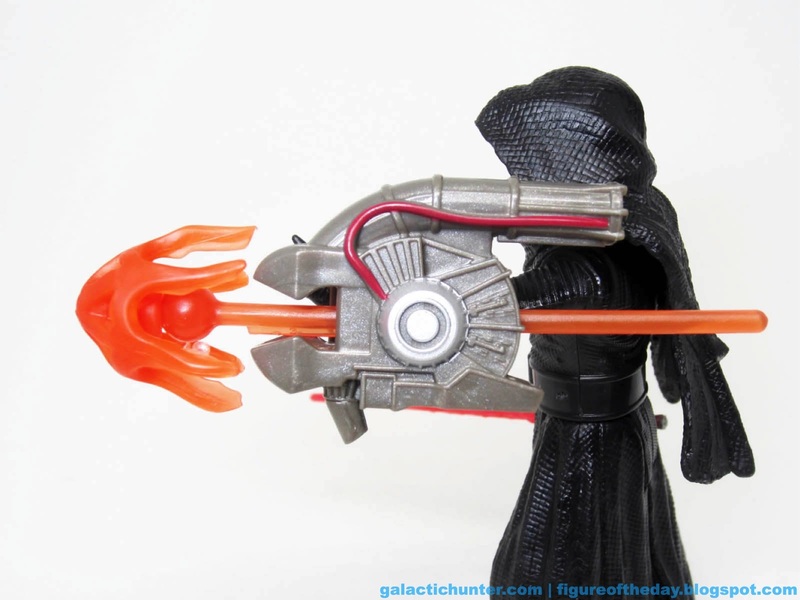 The projectile is a tight fit in the launcher, with a red energy tip that pops off on a ball joint. It looks like it was forged from the same junk drawer that gave up parts for his lightsaber, and it shoots a couple of feet. It's not as magically soaring as a Nerf dart, and it couldn't make it to my couch a few feet away - whereas the A-Wing's Nerf dart shoots so far and fast, it bounces off the wall across the room. I know, I know. You hate Nerf. But it works real well. 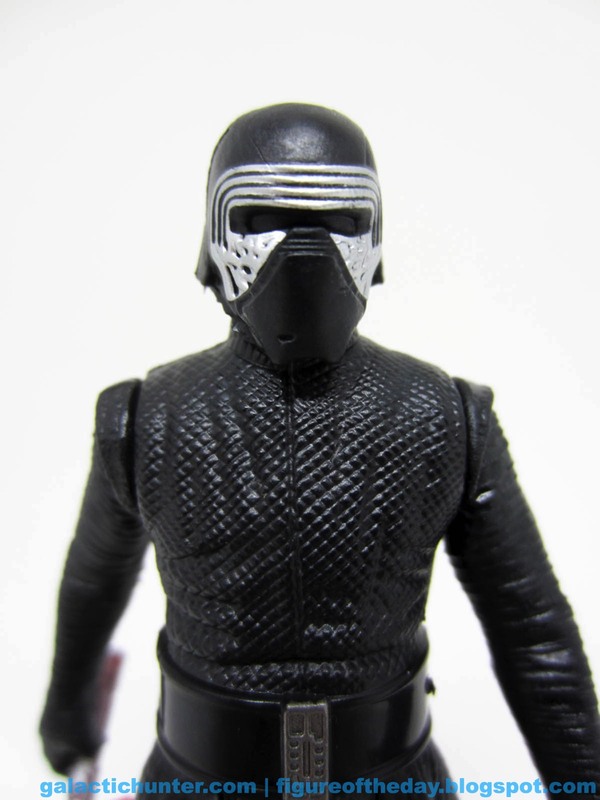 Since Kylo Ren has the same sculpted costume as before, you know that you're going to be impressed by the cloth texture and folds in the fabric. Depending on your standards, this is a new-enough figure. A new head on an existing body with a new weapon isn't wildly different, but it's different enough that I can say I'm glad Hasbro did it. It's not like "Here's another Luke you already own but with a backpack." The new head makes a difference to me, at least, so I'm not going to whine that Kylo Ren took up 2 slots in a Rogue One case that seems to totally lack the film's heroes in wave one. And also a lot of wave two. Based on some early grocery store street date SNAFUs, it would seem not entirely unlikely that this will be the pegwarmer in the first few weeks. 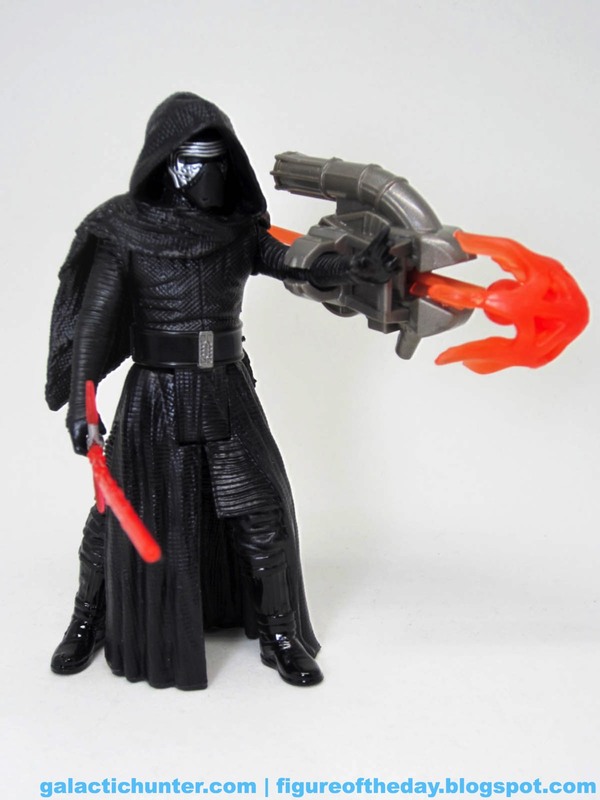 It also wouldn't surprise me if he got snapped up by the non-hardcores as time goes on, because it's Kylo Ren and people still buy him. If you want an unhooded, helmeted one this is the one to get. There's no call-out on the package to identify this specifically, just a little piece of art that says "Projectile Firing." Which is accurate - but remember the awesome power of 2005 when, in giant letters, Chewbacca's packaging boasted "WOOKIEE RAGE." Hell yeah. Those were the days.